Breeding: Coniferous forest edges and openings, semi-open coniferous forests near water, burned areas, wetlands. This is a medium-sized tyrant flycatcher (family Tyrannidae) but a large “flycatcher” as that common name is applied. 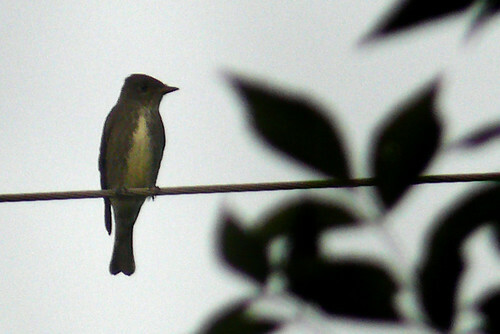 Only Great-crested flycatcher is larger. Adults have a tapered body, are 7″ to 8″ in length, and have a wingspan of 13″. The upper parts are olive-gray to olive-brown. The center of the breast is white and contrasts sharply with dark, olive-gray, streaked or mottled sides, giving the appearance of a dark “vest”. The belly is whitish. The undertail coverts are whitish with well-defined, dark, V-shaped markings. The wings are pointed and have indistinct pale wing bars. The tail is proportionately short. There is a white patch above each wing on the side of the rump but this is not usually visible when perched. The head is large and dark. The chin and throat are white. The eye ring is inconspicuous. Eastern Wood-peewee (Contopus virens) is smaller. The breast and sides are gray with no dark “vest”. There are no white patches on the rump. The markings on the undertail coverts are smudged. The wings have white, narrow but conspicuous wing bars. Flying insects, especially bees, wasps, and ants, but also moths, grasshoppers, dragonflies, and beetles. They defend their nests aggressively against squirrels and other predators. Early May to Mid June and early August to late September. They migrate alone, not in flocks. Olive-sided Flycatcher has the longest migration of any North American flycatcher. Breeding grounds are the Rocky and Cascade Mountains from Texas to Alaska, across Canada and the northern border states to Newfoundland and Vermont. In Minnesota the breeding range includes the northeast third of the state. Wintering grounds are mostly Panama and the northern Andes Mountains from northern Venezuela to western Bolivia. 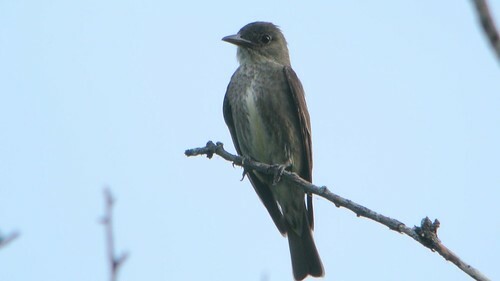 George Jameson sent us this olive-sided flycatcher video. Olive-sided Flycatcher singing " Quick - Three - Beers "